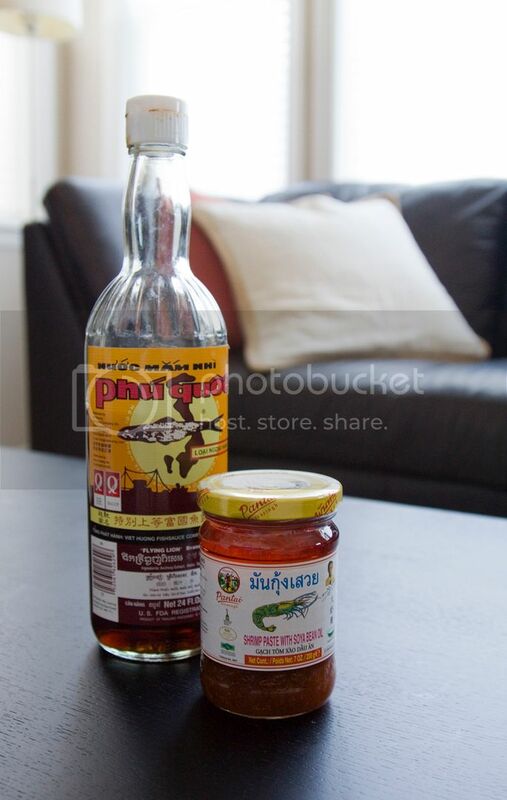 Fish sauce became one of my staple seasonings couple years ago. It adds so much more flavor to Asian dishes ranging from stir fry veggies to soup noodles. As for the shrimp paste, I had it quite often when dining at South East Asia style restaurants, but never had a chance to actually use it myself. I finally bought a jar of shrimp paste from a local 99 Ranch market earlier, but it was intended for a stir fry banh pho (rice noodles) instead of this recipe. 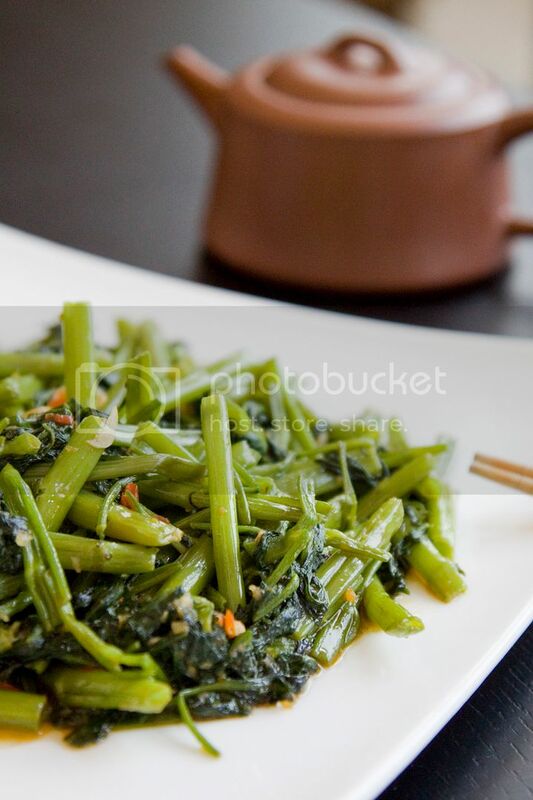 Stir fry ongchoy with shrimp paste is such a popular dish among Asians. So I figured might as well give it a try with the vegetable first instead of a big portion of rice noodles. If anything goes wrong, as least the damage is tolerable. Luckily, my ongchoy turned out just the way I wanted it to be! Ongchoy, we called it 空心菜 in Chinese. The direct translation would be "hollow center greens." 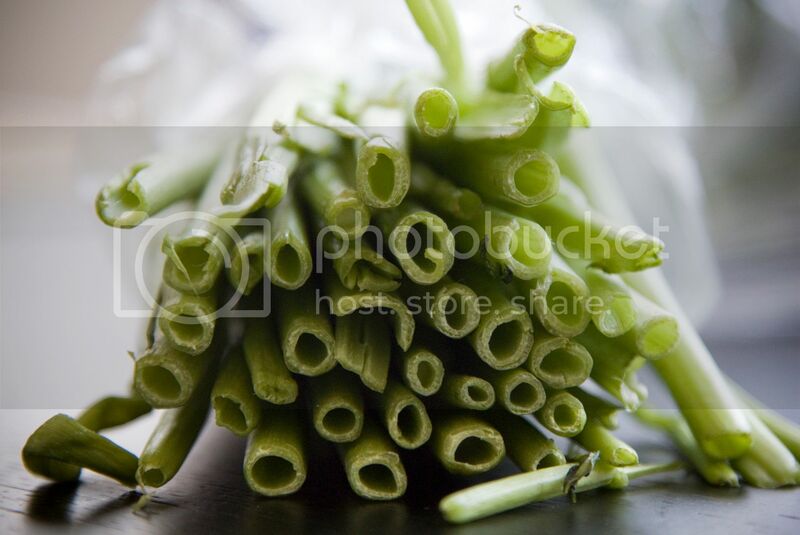 If you ever feel lost in an Asian market with all the exotic looking vegetables on the shelves, just look for hollow stems and you'll have the correct item on hand. Thoroughly rinse and soak the vegetable before usage. Once done, drain well and chop off the very end stem, about 1 inch. Chop the remaining greens about 2 inches in length. Peel and slice the garlic cloves. Remove the stems from the chilies and chop into smaller pieces. Drizzle 3 tablespoons of olive oil into the pan and turn to medium heat. Add in garlic slices, chilies, and a small pinch of sea salt. Cook till the garlicky aroma comes out but not burned. You might need to lower the heat a little bit to prevent burning. Try to cook till the edges of the garlic slices turned slightly brown. Turn to high heat and add in the ongchoy immediately. Give it a quick stir first so the garlic slices won't stuck on the bottom and get burned. Add in the shrimp paste, fish sauce, and a little bit of soy sauce. Mix well and cook till the vegetable begins to wilt. Cook a little bit longer so that the seasoning can soak into the greens. Generally speaking, the hollow stems should remain slightly crunchy once done. I think shrimp paste will be one of my staple seasonings in the pantry from now on. This ongchoy recipe looks really good. Your food blog and photography is really impressive! If you’re interested, we would like to send you an invitation to join our new invite-only food community that we have just launched. 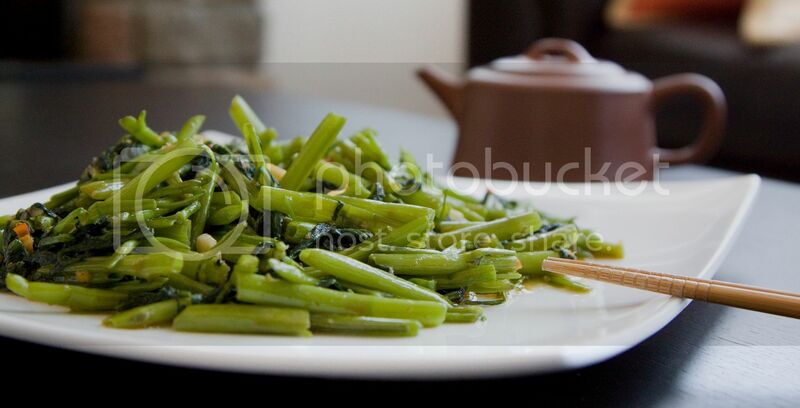 Grub Snapper is a community to share and discover extremely delicious recipes and food. You can vote and comment on other members' recipes and follow their activity. We also hope our community will help you promote your food blog to other foodies like us. Thank you for the info. I will definitely take a look at it ASAP! Stir-fry On Choy (a.k.a Kang Kong in S'pore) with Shrimp Paste (make it spicy!!!) is a popular local dish in Singapore! Thank you for the information. Btw, are you based in Singapore or somewhere else? Because I'm visiting Singapore during Xmas and would like to find out where to eat! I'm looking a Shrimp Stir Fry recipe because I want to cook it later for my visitors. I choose your recipe because I think it is easy to cook. Thank you so much for sharing this one.